8 EPSO Verbal Reasoning Tips and Tricks. I consider Tip #5 ESSENTIAL. The EPSO verbal reasoning tests should not be underestimated. It is a test type that doesn’t necessarily feature an exact answer. You may need to find the best answer, therefore pay close attention to the requirements of the verbal reasoning test. The questions on EPSO verbal reasoning tests are highly specific. There will usually be 4 to 7 rows of texts and four statements. You will need to select the best statement that can be deducted from the texts. There will be times that the statement will not be straightforward so make sure that the final answer will be based only on the text provided. Keep an eye on the watch- There will come a point in the espo test when one question will stall you and eat up most of your time. When you are faced with this predicament, it’s recommended to move on first to other test questions. You can easily come back to the question. If you still find the question difficult, you can always make a sound guess that you think is the most likely answer to the question. Doing this will help you cover all questions and not miss out on simple questions. Get an overview of what the paragraph is all about. There will be times when questions will be based on a certain paragraph. If this is these, make sure you scan the text and find out its main content or message. Each paragraph from the epso verbal reasoning test should contain 2-5 sentences, so it should take roughly 20 seconds to cover it. – You can eliminate some of the answers that offer unnecessary information. If the sentence does not link to the passage at all, then that’s a sign to cross out that answer. Limit your understanding and answers on what was provided on the paragraph- When answering questions that are based on a certain article or passage, it’s recommended to answer the questions only in the context of the paragraph. If you have seen some loopholes or inconsistencies in facts, don’t comment or change the content. Simply mark the answer as you have understood it. Take time in answering the verbal reasoning questions- Remember, you will not be given extra credit by simply answering it faster. When you have time, always review your questions and answers. Expect other candidates at the CBT Centre during your test. Don’t let others make you lose your attention on the test. If possible, try to practice as much as possible epso verbal reasoning tests at home under real exam conditions with no interruptions. 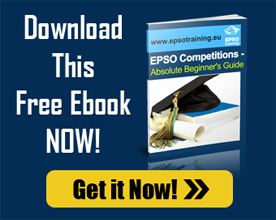 Start your training with some FREE Epso Verbal Reasoning Tests ! Once you are confident with the similar exam interface and testing format, practice more verbal reasoning tests.